Marta Harnecker (pictured) will be one of the keynote speakers at Socialism for the 21st century: Moving beyond capitalism, learning from global struggles being held in Sydney on May 13-15. January 2016 — Monthly Review, reposted on Links International Journal of Socialist Renewal with the author's permission — In recent years a major debate has emerged over the role that new social movements should adopt in relation to the progressive governments that have inspired hope in many Latin American nations. Before addressing this subject directly, though, I want to develop a few ideas. The situation in the 1980s and ’90s in Latin America was comparable in some respects to the experience of pre-revolutionary Russia in the early twentieth century. The destructive impact on Russia of the imperialist First World War and its horrors was paralleled in Latin America by neoliberalism and its horrors: greater hunger and poverty, an increasingly unequal distribution of wealth, unemployment, the destruction of nature, and the erosion of sovereignty. July 14, 2013 -- Life on the Left, posted at Links International Journal of Socialist Renewal with permission -- Two recent events — the second-round victory on November 22 of right-wing candidate Mauricio Macri in Argentina’s presidential election, and the December 6 victory of the right-wing Democratic Unity Roundtable, winning two thirds of the seats in Venezuela’s National Assembly elections — have radically altered the political map in South America. In the following interview, Argentine Marxist Claudio Katz discusses what these setbacks for the left mean for the progressive “process of change” that has unfolded on the continent over the last 10-15 years. My translation from the Spanish. Katz is a professor of economics at the University of Buenos Aires, a researcher with the National Council of Science and Technology, and a member of Economists of the Left. Initiated just over four years ago, the Left and Workers Front (FIT) in Argentina has become a key reference point on the left, and is quickly earning its place on the national political scene. The FIT was formed as an alliance of three Trotskyist parties: the Socialist Workers’ Party (PTS), Workers Party (PO) and Socialist Left (IS). It began largely as an attempt to overcome new electoral obligations requiring parties to win more than 1.5% of the vote in Open, Simultaneous and Obligatory Primaries (PASO) in order to stand in elections. In a context where the far left has traditionally performed poorly in presidential elections, the FIT were relatively successful in their first electoral venture – the 2011 PASO for that year’s national election - with presidential pre-candidate and historic figure on the left, Jorge Altamira, winning over half a million votes (2.46%). In the PASO held July this year, more than 750,000 people voted for one of the two FIT presidential pre-candidates. Unable to come up with a united slate, the FIT used the mechanism of the primaries to let voters decide their candidate list for president-vice president. 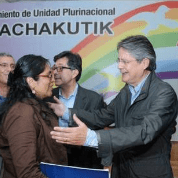 Should Ecuador's left work with the right against Rafael Correa? Banker and opposition leader Guillermo Lasso (second from right) meets with leaders from the Pachakutik political party in their offices in April 2015. August 20, 2015 -- Originally published by TeleSUR English, posted at Links International Journal of Socialist Renewal -- For a relatively small nation, in terms of size, population and economics, Ecuador has been a major player in contemporary Latin American politics, particularly on the left. The experience of toppled governments by popular uprisings, led by Indigenous organisations with radical left-oriented politics, has contributed to a regional shift that ushered in the Bolivarian Revolution in Venezuela and later the election of Evo Morales’ Movement Toward Socialism in Bolivia. 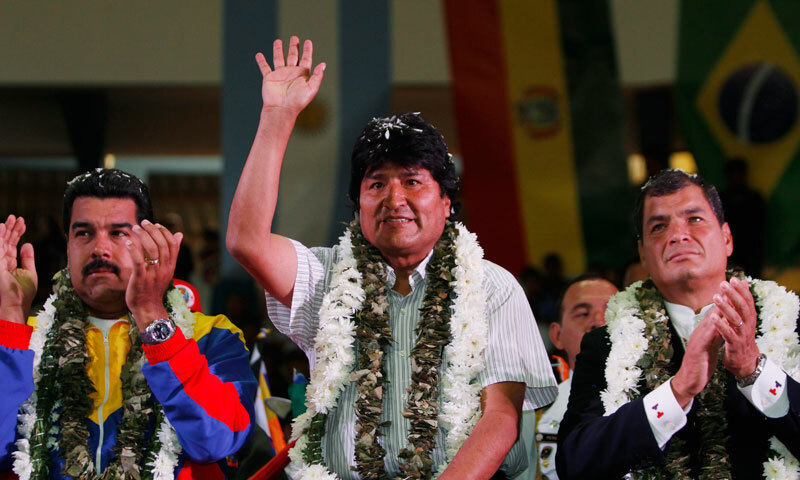 Rafael Correa (right) with Venezuela's President Nicolas Maduro (left) and Bolivia's President Evo Morales. August 15, 2015 -- Green Left Weekly, posted at Links International Journal of Socialist Renewal -- Ecuador'sPresident Rafael Correa and social movements behind Ecuador’s “Citizens' Revolution” are engaged in yet another battle against the South American country's entrenched elites. 2015. augusztus 06 -- Green Left Weekly/Latin-Amerika Társaság -- A 2013-ban elhunyt Hugo Chávez egykori venezuelai elnök és forradalmi szocialista július 28-án lett volna 61 éves. Bár Chávez eltávozott, emléke a venezuelai politikai színtér kitörölhetetlen része maradt. December 6-án Venezuela huszadik alkalommal fog az urnákhoz járulni azóta, hogy Chávezt 1998-ban először elnökké választották. Eközött a két időpont között a szegénypárti átalakítási folyamat jelentősen visszavetette a szegénységet és hatalommal ruházta fel a szegény többséget. Komoly akadályokkal is felmerültek, amely akadályozzák és veszélyeztetik a „bolivári forradalom” – ahogyan a Chávez által vezetett folyamatot hívják – fennmaradását. A decemberi nemzetgyűlési választás egy újabb kritikus ütközetet jelent azok között, akik 15 éven keresztül támogatták vagy ellenezték Chávezt. A chavista erők számára létfontosságú a győzelem, hogy megvédjék és elmélyítsék a forradalmat. August 5, 2015 -- Green Left Weekly, posted at Links International Journal of Socialist Renewal -- Had Hugo Chavez not passed away in 2013, the former Venezuelan president and revolutionary socialist would have turned 61 on July 28. However, though Chavez is gone, his indelible imprint on Venezuela’s political landscape endures. On December 6, Venezuelans will go to the polls for the 20th time since Chavez was first elected president in 1998. Between then and now, a process of pro-poor transformation has significantly cut poverty and empowered the poor majority. It has also confronted serious obstacles blocking further advances and threatening the survival of the “Bolivarian revolution”, as the process pushed by Chavez is known. The December election for the National Assembly is shaping up to be another critical battle between forces that for 15 years either supported or opposed Chavez. For the Chavista forces, victory is vital to defending and deepening the revolution. 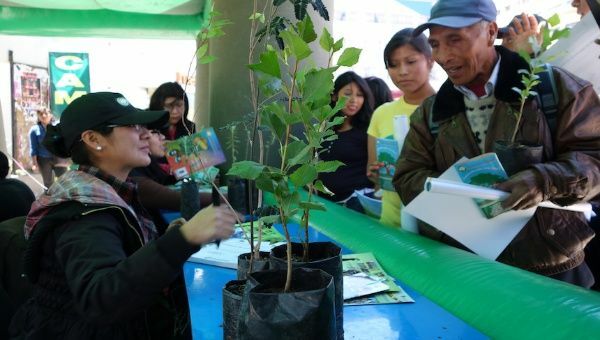 Bolivians receive free tree saplings as part of the "My Tree" program, which combats deforestation. 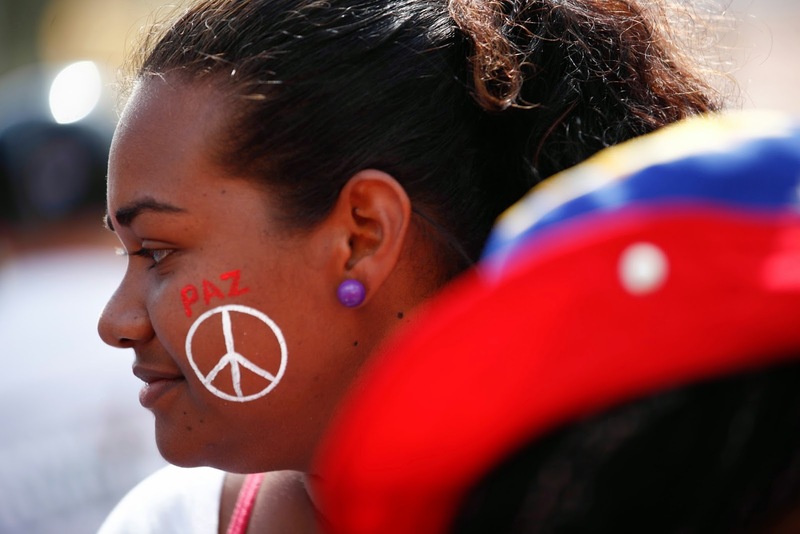 Photo via TeleSUR. July 27, 2015 -- Green Left Weekly, posted at Links International Journal of Socialist Renewal -- When Bolivia's President Evo Morales announced in May that his government was allowing oil and gas drilling in national parks, mainstream and progressive media outlets alike were quick to condemn his supposed hypocrisy on environmental issues. Writing for the Associated Press, Frank Bajak argued that although Morales is known internationally for his outspoken campaigning on climate change, at home he faces constant criticism from conservationists “who say he puts extraction ahead of clean water and forests”. Bajak said this contradiction was a result of Morales’ strategy of developing extractive industries as a means of cutting poverty, regardless of the environmental cost. Democracy Now! July 20, 2015 -- Report from the opening of Cuba's new embassy. Transcript available HERE. July 20, 2015 -- COHA, posted at Links International Journal of Socialist Renewal -- Amid cheers of “Cuba sí, bloqueo no” (Cuba yes, embargo no), hundreds gathered on Washington, DC’s busy 16th Street to bear witness to the symbolic close to one of the more misguided chapters of US foreign policy. Trumpeting fanfare sounded as Cuban honour guard soldiers raised their country’s flag above what is now Cuba’s embassy in the United States. Cuba's foreign minister Bruno Rodríguez Parrilla presided over the flag raising and was accompanied by a large US delegation led by assistant secretary of state Roberta Jacobson. “It’s a new beginning, it’s a new opportunity for the people of Cuba,” said Karla Ramos, one of the spectators, in an interview with COHA, mirroring the sentiments of many others there to celebrate this momentous occasion 54 years in the making. Venezuela's President Nicolas Maduro at the campaign close for primary elections for the United Socialist Party of Venezuela, June 26, 2015. Photo: AVN. 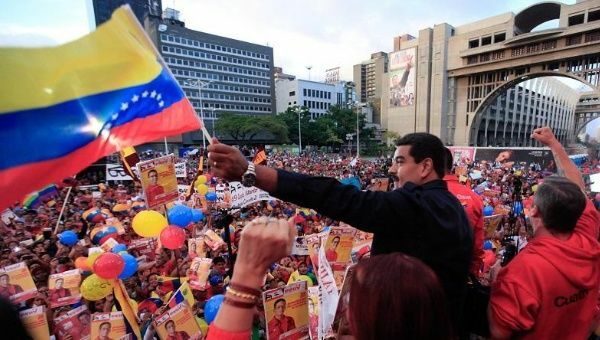 June 28, 2015 -- TeleSUR English, posted at Links International Journal of Socialist Renewal -- Millions of members of the governing United Socialist Party of Venezuela (PSUV) hit the ballot box on June 28 to vote for the left-wing party’s candidates for parliamentary elections to be held in December. "Here are these candidates, they are men and women who come from the people, they were nominated by the grassroots (of the party), now it is up to you to choose,” stated Venezuelan President Nicolas Maduro on June 26 during an event to celebrate the close of campaign. A Cuban literacy program operating in an Aboriginal community in Wilcannia, NSW. June 15, 2015 -- Green Left Weekly, post at Links International Journal of Socialist Renewal -- Kenia Serrano, president of the Cuban Institute for Friendship with the Peoples (ICAP) and a member of Cuba's National Assembly, attended the recent national consultation of the Australia-Cuba Friendship Society. Green Left Weekly's Denis Rogatyuk spoke with her about recent developments of the Cuban Revolution. Cuba has just been removed from the list of state-sponsors of terrorism. How do you think this will affect Cuba’s relations with the United States? First of all, there is no reason to have Cuba on such a list. We should have never been there. However, the US decided to do this back in 1992. On May 29, the removal was approved. We consider this a very positive step in eliminating the different obstacles to forging stable bilateral relations with the US.